If you own a Ski-Doo, the No. 1 selling snowmobile, take joy in knowing that there is a wide world of aftermarket bits and pieces to help you (a) get more performance, (b) better handling and ride and (c) customization upgrades. The bits are there. You can have a dealer do the work or you can supply the labor over the summer so you can have a “new” sled at first snow. 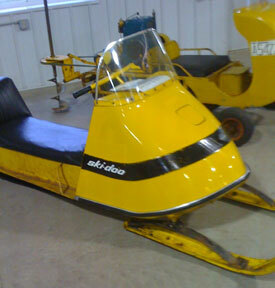 Since Ski-Doo has been a big seller from Day One — Well, Ski-Doo did kind of create Day One way back when! — you might own a vintage or newer model that needs a little help. First of all, there should be plenty of old pieces available scattered around snowmobile junkyards, swap meets and the occasional roadside sale. Secondly, some of the performance shops that built speed parts for Ski-Doo racers back in the day have begun to refabricate cylinders and exhausts. Some of the pieces are rebuilt while others are new “old” parts. Either way, if you are restoring a Ski-Doo chances are good that you can find experienced like-minded Ski-Doo people from whom you can learn and who might be able to help guide you to the source for obscure parts for something like a 1969 Ski-Doo Olympique 320 SS with the 335cc single. Because Ski-Doo is the Number One selling snowmobile there are many aftermarket choices for upgrading performance. Some aftermarket companies offer products to help you restore your classic Ski-Doo. Whether you are looking to upgrade a current model or restore a vintage classic, summer makes for easy Ski-Dooing. Here are some suggestions for places to start your Ski-Doo summer upgrade. Ski-Doo performance guru Larry Audette started The Crank Shop back in the 1980s as more of a hobby than a business. But due to the success of the parts that he built, The Crank Shop performance parts and services gained “must have” credibility with serious Ski-Doo racers. Over the years the Vermont-based shop grew to employ about a dozen people and service hundreds of dealers across North America. Audette’s signature triple-cylinder custom engines earned worldwide fame for their power and performance capabilities. While the top line custom engines gained The Crank Shop its reputation, the company offers other custom Ski-Doo products for trail sleds that include big bore kits, customized flatslide carburetors and a variety of performance exhaust pipes. The Crank Shop enjoys a history with performance Ski-Doo models and retains its expertise with Ski-Doo’s Rotax-built rotary-valved performance motors. The company offers cylinders and other induction parts for those near-vintage rotary-valved 340cc Sno Pro twins raced from 1979 to 1981. In addition to customized services and parts, The Crank Shop carries a variety of clutch tuning parts, OEM parts, pistons, ignitions and much more. If you want your Ski-Doo to carry extra attitude on the trail, The Crank Shop is a good place to get it. 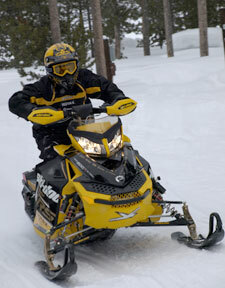 One of the established shops for western Ski-Doo riders is Idaho-based Starting Line Products. Long recognized for its custom services and proprietary deep snow innovations, SLP offers a variety of go-high products for Ski-Doo powder players. 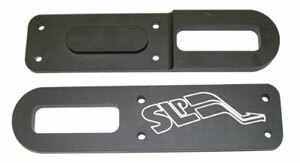 The SLP Slide Rail Extensions have been engineered to fit various Ski-Doo mountain sleds and let you extend the suspension rails to accommodate use of longer tracks for greater float in deep snow. The kit comes with complete installation instructions and all the necessary hardware. Kits retail for less than US$100. The SLP 2 Wheel kit converts the Ski-Doo XP’s rear axle from a three-wheel rear idler to two-wheel setup for claimed easier sidehilling. The SLP kit moves the outside idlers toward the inside of the axle, eliminating the need for the stock third wheel. This kit retails for US$69.95. The SLP Powder Pro Ski provides exceptional performance in deep powder or loose snow conditions and substantially increases your Ski-Doo’s steering ability. SLP contends that the improvement in flotation results in more front end lift which reduces drag on front end components such as the belly pan, bulk head and front suspension. 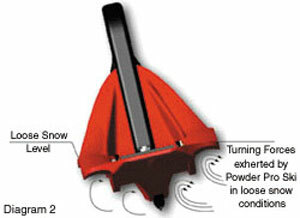 The SLP Powder Pro Ski is claimed to enhance maneuverability at slow speeds in deep snow. SLP’s Powder Pro Ski has patented bottom design features such as a unique multi-level keel that gives you aggressive steering capability with minimal arm effort. The ski’s lower keel is the only part of the ski to contact the snow in packed conditions and provides precise, easy steering characteristics with maximum reduction of darting on packed or groomed snowmobile trails. The Powder Pro Ski features added flotation and increased steering control, which work in concert with today’s long tracks. They also work very well on shorter tracked models such as crossover sleds like the Renegade and even performance short-trackers in loose snow conditions. Wisconsin-based Aaen Performance is the singular performance pioneer in snowmobiling, arguably having established the aftermarket performance business in snowmobiling. Still headed by founder Olav Aaen, the company’s latest “hop-up” product for your Ski-Doo is the Aaen Trail Quiet Performance Pipes with Double Core Silencers. These pipes are said to combine power with reduced weight, all the while managing a quiet sound level on-trail. This new set of pipes has undergone three years of testing including many hours of dyno runs. Real world testing in environments from grass drags, asphalt racing to field testing were made to confirm the power improvements. One of the secrets to the lighter weight, higher performance, quiet sounding pipe design is “internal stinger” technology that Aaen has continuously developed since the late 1970s. This advanced design cuts sound in half before the pressure pulse reaches the “Double Core” silencers, where it results in a mellow “turbo purr” acknowledging performance without that annoying high decibel noise. The end result is a wider power band combined with a lighter weight silencer. Aaen claims an eight horsepower power increase on Ski-Doo’s 800 REV with a weight savings of up to 15 pounds. 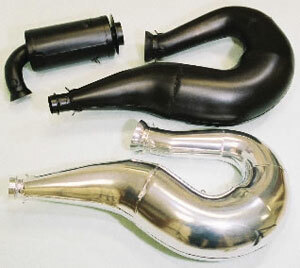 Trail Quiet Performance Pipes and Double Core mufflers are available in high heat black or silver ceramic coating. Retail pricing for the pipes starts around US$300. 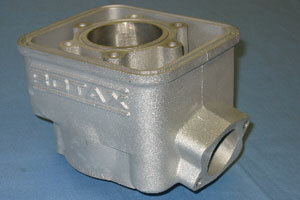 In addition, Aaen Performance offers a catalog of pipes for various Vintage models.